This will have everyone talking at your celebration, from children to adults, who could resist it’s cuteness! 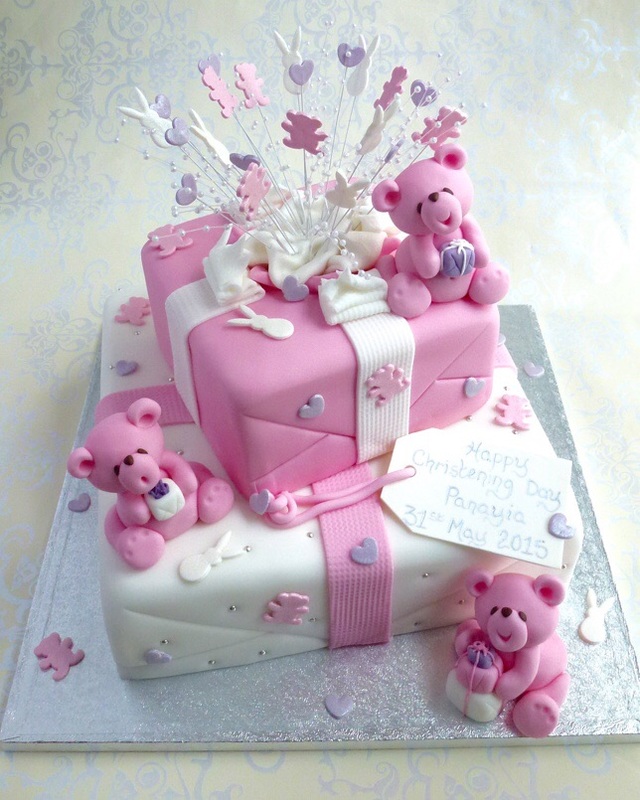 Everything on the cake is hand crafted from icing and the teddies in particular make a lovely keepsake. There is a choice of cake flavour combinations. This cake can be personalised by using the drop down boxes in the ” Order your Cake ” section. A light, soft textured vanilla Genoese cake, layered with fresh vanilla butter cream, topped with white almond paste and covered with soft icing. Please note novalty cakes are not topped with white almond paste. Melt in the mouth rich Belgian chocolate cake, layered with fresh Belgian chocolate buttercream, topped with a thin layer of white almond paste and covered with soft icing. Please note this cake can be gluten/wheat free but please tick the gluten/wheat free box when ordering. Please note novalty cakes are not topped with white almond paste. As above but free from Gluten or Wheat. We have strict procedures to make every effort that there are no traces of gluten or wheat in the fully decorated cake. However, we do obviously have products that contain gluten and wheat on the premises, so if you have a severe allergic reaction to minute traces of these products we are unable to guarantee they are completely free from them. These are no compromise, our secret recipe will have you come back for more again and again! The toppings are the same as above. The cakes are victoria sponge with fresh vanilla buttercream topped with a thin layer of white almond paste and coated with soft icing. We have strict procedures to make every effort that there are no traces of gluten or wheat in the fully decorated cake. However, we do obviously have products that contain gluten and wheat on the premises, so if you have a severe allergic reaction to minute traces of these products we are unable to guarantee they are completely free from them. Our deliciously moist dairy free recipe will have you come back for more again and again! The cake is layered with fresh vanilla frosting, topped with a thin layer of white almond paste and coated with soft icing. PLEASE NOTE this recipe does contain egg.